Welcome to Year 7 & 8! We love that we are a full primary. The full primary school experience is the chance for our year 7 and 8 students to mentor the younger students and in turn learn empathy, patience and respect. Our senior students build their confidence, resilience and integrity as respected leaders in our school. These are important years of self development and it makes sense to allow these skills to consolidate before the transitioning into a new school in Year 9. It is a time to take the mentoring and learning they have had over the last 6 years and build on their individuality and voice in our school community and thus developing their readiness for high school. Children do not miss out on opportunities. Individualised learning, less transition time means more learning time. Combined with small class sizes allows maximum student and teacher interaction, maximising learning. ​Awesome opportunities for leadership - All students are encouraged to take on a leadership role. We offer peer mediator training, a term by term rotation of house leadership and school councillor, giving our students multiple opportunities to step up and lead our school. 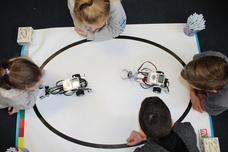 We are a BYOD school that uses devices in conjunction with our academic learning but we also have opportunities to learn robotics, media arts, coding and embrace the new Digital Technology Curriculum. A wide variety of sport teams, tournaments and challenges over the year - Sports Camp at Totara Springs, Lower Waipa and Full Waikato Primary Competitions, Sports Specialist Learning with Project Energize, Basketball, Touch, Hockey, Soccer, Indoor Netball, Swimming, Cross Country, Athletics, Triathlon, Interhouse Competitions, Cheerleading, Gym Sports and Aims Games Festivals, Winter sports tournament. 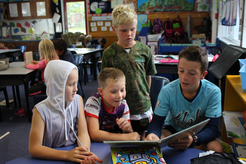 Cultural experiences - kapahaka, extension Te Reo, bi-annual productions, rock and symphonic band, marae experiences, museum trips, visiting specialists, choir and music lessons and Pirongia School’s Got Talent. Our Tech Arts programme is run on a Thursday from 11:00 - 2:55. We have small numbers in each class (around 13 per group), with specialist teachers, and well-resourced classes. Media Arts, Music, Sewing, Food Technology, Visual Art, Hard Materials, Coding & Robotics. We operate a 3 x 9-week cycle so all students try each area of tech arts. 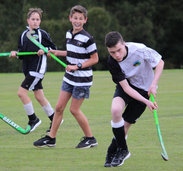 EOTC Education Outside the Classroom - Year 8 students go to Hillary Outdoors Tongariro Camp in Term 4 of each year while the Year 7 students go on a City Camp. We also have a start of year team building camp at Kaniwhaniwha, week long Sports Camp in Term 3, Pirongia Mountain Day (Hike), Mountain Biking, River crossing, Lake Ngaroto Sailing, Environmental Groups/Enviro School days.